No sooner had I written my post espousing the virtues of my pug when her long anticipated fly magically materialized. Ah, I thought, a miracle! A perfect testament to the diligence of faith. Alfie trusted and like Abraham and Moses in the Old Testament she was rewarded for her faith. Instead of the Promised Land, she received the Promised Fly buzzing around her head as if summoned by her watchful gaze. How exciting to witness this blessing! Alfie seemed caught up in the moment as well. She followed the fly with her eyes and then jumped up to the head of the bed to get a closer look. Before I knew it, she was standing on her hind legs reaching skyward in adulation. The Promised Fly! Her tongue hung out, her eyes glazed over and in an instant she leapt in the air, her jaws closing on the tiny creature. She swallowed it whole in one gulp, even licking her chops in satisfaction. Then, she sat back on the bed, her murderous frenzy at an end. She returned to staring at the ceiling expectantly, waiting yet again for another just reward. 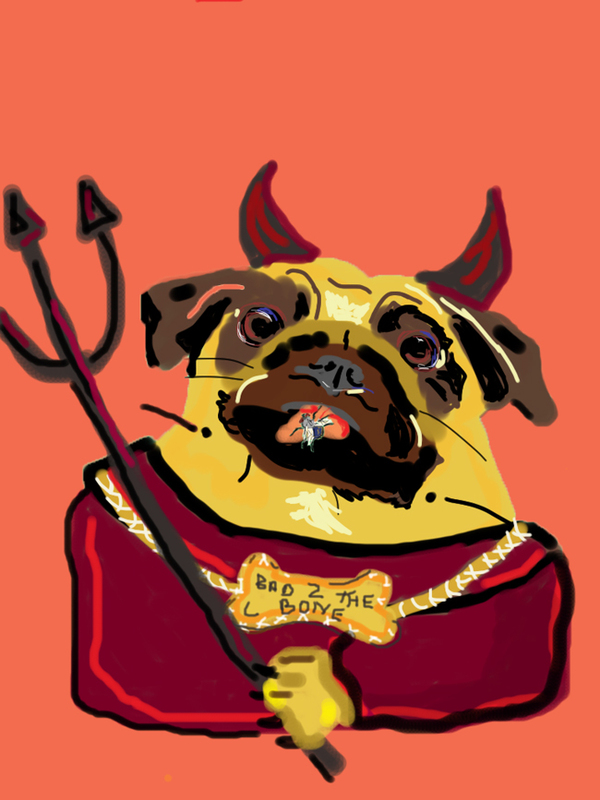 In under a minute my sweet pug had gone from saint to sinner and back again. Ah, my Alfie, no worse than me, no worse than any human. And, perhaps in this act, too, she still could serve as a spiritual model. Although she had fallen and given sway to the power of sin, and in typical pug fashion, gluttony, she did not wallow in it. Unlike we humans, who so often allow guilt and shame to keep us in a piteous state, she dusted herself off, exchanged her pitchfork for dented halo and resumed her walk of faith. Still, an example I could follow.